All new this beautiful fabric come to us from Europe. 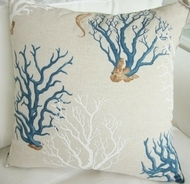 Bacground color is a nice linen shade with a coral print in blues, whites and shades of tan. We also offer this print in a red colorway. Need a special size, want it with or without trim? Just let us know we are happy to accomodate you.